Our popular slatwall displays now are available in retail counter display versions! 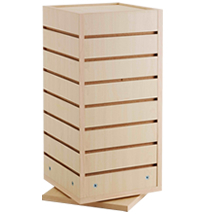 This maple 4-sided slatwall cube display spins for easy accessibility to all sides. Available in Black, Cherry and Maple. Choose from a tremendous variety of slatwall accessories to customize the appearance of your display. Save on shipping costs by choosing local pickup at checkout. Our showroom is located at 454 Jarvis Ave, Des Plaines, IL. We are right off the expressway near O`Hare Airport. Pick your order up at our Chicago area showroom.